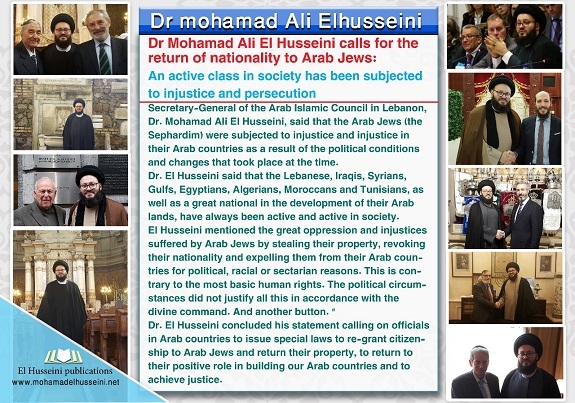 • الموضوع : Dr Mohamad Ali El Husseini calls for the return of nationality to Arab Jews: An active class in society has been subjected to injustice and persecution . Secretary-General of the Arab Islamic Council in Lebanon, Dr. Mohamad Ali El Husseini, said that the Arab Jews (the Sephardim) were subjected to injustice and injustice in their Arab countries as a result of the political conditions and changes that took place at the time. Dr. El Husseini said that the Lebanese, Iraqis, Syrians, Gulfs, Egyptians, Algerians, Moroccans and Tunisians, as well as a great national in the development of their Arab lands, have always been active and active in society. El Husseini mentioned the great oppression and injustices suffered by Arab Jews by stealing their property, revoking their nationality and expelling them from their Arab countries for political, racial or sectarian reasons. This is contrary to the most basic human rights. The political circumstances did not justify all this in accordance with the divine command. And another button. " Dr. El Husseini concluded his statement calling on officials in Arab countries to issue special laws to re-grant citizenship to Arab Jews and return their property, to return to their positive role in building our Arab countries and to achieve justice.